After 12 years entertaining a generation of pre-schoolers with stories, songs and dancing Marie Murdoch will hang up her tiara and fairy wings. 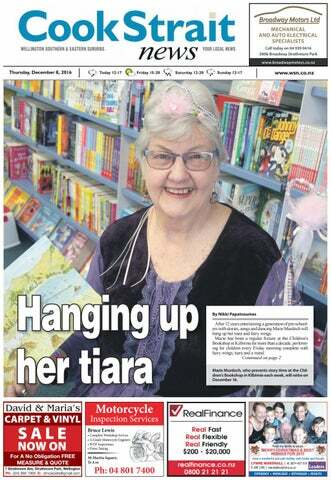 Marie has been a regular fixture at the Children’s Bookshop in Kilbirnie for more than a decade, performing for children every Friday morning complete with fairy wings, tiara and a wand. Continued on page 2 Marie Murdoch, who presents story time at the Children’s Bookshop in Kilbirnie each week, will retire on December 16. Wishing HEALTH From you my family to yours AND HAPPINESS FOR 2015 MERRY CHRISTMAS & BEST From our Family to 2017 Yours WISHES FOR Have a wonderful and safe holiday with family and friends Lynne MarshaLL | M. 0274 427 219 P. 388 1395 | marshallnz@xtra.co.nz EXPERIENCE + KNOWLEDGE + ENTHUSIASM = RESULTS! Hanging up her tiara Continued from page 1. However, with a milestone birthday approaching, Marie, who has become a second grandmother to many of the children she entertains, has decided to retire and her last session will be on Friday, December 16.
at Marsden School. When we heard she was going to leave Marsden we asked if she would like to come in and do a story time session every Friday with us. “It has been great having the continuity because it’s something regular in the childrens’ lives and I think a lot of them have come to see Marie as an extra grandma,” Ruth said. Ruth invited anyone who had enjoyed story time with Marie over the years to come and enjoy her last session. “Anyone who used to visit Marie and is able to come along to her final session is invited. We want to make it very special.” She said a replacement for Marie would be hired in the New Year.  The Children’s Bookshop invites all Marie’s fans, from the most recent to those who are now teenagers, and their parents to join them for her last session on Friday, December 16 at 10.30am. and experts in one place will help businesses and individuals deal with post-quake issues quickly and more easily,” Mike said. “People affected by the quake are already carrying some stress and we need to help them through this period.”  The centre is located at the corner of Lambton Quay and Stout Street, and will be open from 10am to 7pm Monday to Friday. If there is demand it may also open 10am to 2pm Saturdays. Prime Minister John Key announced on Monday he would be stepping down from his role as the country’s leader on December 12, wishing to spend more time at home. “[My wife] Bronagh has made a significant sacrifice during my time in politics, and now is the right time for me to take a step back in my career and spend more time at home,“ he said. Mr Key’s expectation is that the National Party caucus will hold a special meeting on December 12 to select a new leader. Parents, staff and children from Owhiro Bay School at the Owhiro Stream. mention or not about whether the water will be safe.” Until test results could be confirmed, the regional council was urging locals to not drink from the stream, however, any contamination was yet to be confirmed. A spokeswoman from T and T Landfills said the company was working with the regional council to resolve any issues. She said until test results came back, there was no proof the water had been contaminated. Celeste Hastings said. “We are taking meaningful steps in our community to educate our children about the importance of drinking water. Families also enjoyed the fresh-fruit flavoured water as a healthy alternative to sugary drinks.” Project Energize aims to get children more active and eating healthy foods. Recently it was introduced into Wellington where it is being run by the Heart Foundation, with funding from the Capital and Coast District Health Board. Schools that enrol in Project Energize work with an ‘Energizer’ to meet each schools’ specific needs. A display at the food fair water station of sugar quantities in commonly-consumed soft drinks and energy drinks surprised many who attended the event and helped them better understand the benefits of drinking water. “In the absence of sugary drinks, the excitement and energy levels normally associated with sugar spikes from treat drinks were kept in balance. Everyone enjoyed the event due to the healthy choices that were available,” Celeste said. “We plan to set up two water stations next year to better cater for demand.” The Heart Foundation’s Energizer Brianna Tekii supported the school with the water-only transition. “Promoting water-only at this school event got many people thinking about their drink choices and converted some to drinking fruit infused water instead of sugary drinks,” said Brianna. The Island Bay Community Carols are voted one of the favourite local events, and they are back again for Christmas 2016. The family event is run by the combined churches of Island Bay and will be held on Sunday December 11 on St Hilda’s Anglican Church lawn, 311 The Parade, starting at 4.30pm with games for kids. The free sausage sizzle is at 5pm and then Christmas carols at 6pm, when locals can join in with the pop-up choir. Families are encouraged to bring a picnic mat and extra picnic food and enjoy the Island Bay spirit of Christmas. Fire at Hospital A fire broke out at Wellington Regional Hospital yesterday, after a client set fire to a mattress in a bedroom at the hospital’s mental health unit. The incident happened at 6.25am. A spokesperson for the hospital said no clients were injured; however, two staff members were being assessed for smoke inhalation. Although the fire service attended, the fire sprinklers in the unit went off and put out the fire. Toi Two Hundy Toi Poneke’s Toi Two Hundy annual art show is a chance for Christmas shoppers to grab a last-minute art bargain, with all artworks $200 or under. The works of 25 diverse Toi Poneke artists will be exhibiting and selling their paintings, jewellery sculptures and more. The Toi Two Hundy opens at Toi Poneke Arts Centre on Tuesday, December 13 at 5.30pm and runs daily until Thursday, December 22 at 5pm. A spectacular science exhibition titled Bug Lab opens at Te Papa this Saturday. The high impact, hands-on experience will give visitors the chance to learn from the genius of bugs. Visitors will enter a colourful, magical space to see large-scale bug models and explore hands-on science. The exhibition was created by Te Papa and Weta Workshop and is an experience for all ages. The exhibition opens on Saturday, December 10. Ticket prices are $15 for adults and $5 for children, with concession and family tickets also available. Staff from Headstart Hair in Kilbirnie with this year’s giving tree. tag from the Giving Tree at Headstart Hair, at 10 Rongotai Rd in Kilbirnie. Presents must be placed under the tree by December 15 so they can be delivered to Foster Hope in time for Christmas. The residents of Kilmarnock Heights Home were treated to a performance from the Tinakori Handbell Choir recently. events and activities.” She says Christmas time at Kilmarnock Heights Home is like spending Christmas with one big extended family. “We are family here. If residents can’t spend Christmas with their families for whatever reason, they can enjoy Christmas with their family of fellow residents, volunteers and staff who they have gotten to know so well, and Christmas time is certainly very special here because of that,” says Annelize. Kilmarnock Heights Home is operated by Enliven, part of the not-for-profit organisation Presbyterian Support Central, and provides rest home and respite care.  For more information about Kilmarnock Heights Home, located at 20 Morton Street in Berhampore, call 04 380 2034 or visit www.enlivencentral. org.nz. Great Read, Great Price Dr Mike Rabih, Dr Prithika Vijayan and the team wish all of our clients and community a Merry Christmas and Happy New Year! Appointments are available up to and including midday on 23 December, and we re-open for appointments on 9 January 2016. FARS BOOKSHOP 151 The Parade | 383 7102 Do you have a teenager leaving school this year? New Patients Welcome! School Children 13-18 years free! Talk to us today about specialised in-house teeth whitening for only $250 (usually $500) Offer valid to 29 January 2017.
readers have their say... Find out the WORD on the Street. Q: Last week Year 9 students from Rongotai College took part in the school’s Social Action Day. We asked students why they think it is important to give back to the community. Locals will have a rare opportunity to take a peek inside one of Wellington’s historic churches at a special Christmas service next weekend. The Miramar Peninsula Community Trust is excited to offer a carols and candle service at St Christopher’s Church in Seatoun next week. it was deemed unsafe and stamped with a yellow sicker by the Wellington City Council, however, the church and neighbouring hall were purchased by Sir Peter Jackson and his wife Fran Walsh last year. The site is now leased to the Miramar Peninsula Community Trust. Trustee Gillie Coxill said this year they would not only have the usual carols and candle service, they would also have Christmas gifts available in the hall for purchase prior to the service. This year, City Missioner Tric Malcolm would lead the nondenominational carols and candle service, Gillie said. As well as this, Andreas Lepper, who takes percussion classes at the church’s neighbouring hall, would perform on the night. Gillie said it was a great opportunity to get a rare, and up-close, glimpse at the character of the church, including beautiful stained glass windows, and plaques in memory of soldiers who lost their lives in WWI.  Christmas Carol Service and Christmas Gift Market will take place on Friday, December 16 at the Seatoun Village Hall and St Christopher’s Church in Seatoun. There will be gift shopping in the hall from 6pm to 10pm and the carol and candle service will begin at 8pm. All proceeds and donations from the service will go to the Wellington City Mission. Drop in to the Miramar and Mapuia Community Centre The Miramar and Mapuia Community Centre holds a drop in every Monday from 10.15am to 12.15pm. Everyone is welcome to pop in for a cup of tea, or coffee and a chat, and there are books, magazines and puzzles available. Two time Ham of the Year award winners Cameron Harrison have been busy preparing their famous hams for the holiday season. Wellington butchers Rob and Gavin Cameron said as always, they would be in for a busy Christmas. The pair predicted they would prepare nearly 2000 orders for hams before Christmas Day. “The total varies but we usually do a couple of thousand over this period. We’ve started taking orders over the past few weeks,” Rob said. “This is definitely our busiest time of the year.” Cameron Harrison has won 14 awards in the past five years at the 100 per cent New Zealand Pork, Bacon and Ham Competitions. Rob said he believed the secret to a great ham was to stick to “traditional methods” and processes. The brothers agreed it was the traditional methods which made their hams so popular at this time of year. “Ham is a New Zealand thing like turkey is the American thing. Our Christmas is in summer and you can have ham hot and glazed or cold,” Gavin said. Rob said Gavin had come on board last year to help take the brand to the next level, after working in bigger butcheries up north. “I’m helping a traditional butcher keep it traditional while also taking it to the next level with 20 years of experience in the industry,” Gavin said. Rob said this year Cameron Harrison was set to produce more hams than ever before. “We’ll be taking on the bigger scale without losing touch with tradition,” he said. “The Cameron Harrison brand is well recognised and we pride ourselves in quality of delivery and service,” Rob said.  Cameron Harrison hams are still available to order at stores in Ngaio and Kelburn, and in the deli at Ontrays Petone, Moore Wilson’s and selected New World stores. wonderful and so supportive,” she said. Altrusa International Club of Wellington is a registered charity and a community service group made up of Wellington volunteers. Altrusa Wellington undertakes a number of different service projects and fundraisers each year to support a range of different not-for-profit organisations.  Members of the community are encouraged to pop in to the bookshop and place a book under the tree before December 19. The Altrusa Club of Wellington has placed a Christmas tree at the Children’s Bookshop in Kilbirnie. Be in to win! The raffle is set to be drawn by the end of December. Entry for the raffle is with every in-store purchase over $30 you will gain a ticket. Wishing you all a happy and safe festive season! From left, Marie Matheos and Pipi’i Hunt from Pasifika Community Patrol at last year’s Christmas in the Park event. expected to turn up for the event, and if it was anything like previous years, Santa will need to be careful he’s not overwhelmed. “The sight of excited children rushing to great Santa when he arrived on his big red fire truck last year was all the motivation we needed to be part of it again this year,” Alice said.  Strathmore Christmas in the Park is at the Raukawa Street Reserve this Friday, December 9, from 6pm to 8pm. Bring a picnic tea and come along, everyone is welcome. Rongotai OUT& about College Social Action Day Last week, Year 9 students from Rongotai College lent a helping hand to the community for the school’s inaugural Social Action Day. Teacher Louise Richards said the idea was to get students out into the community to work on social action projects. Boys helped eradicate graffiti with the Wellington City Council, planted A group of students get ready to paint a wall in Island Bay, with help from the Wellington City Council. trees with Forest and Bird, helped out at St Aidan’s Church in Miramar and baked Christmas cookies for those in Kaikoura affected by the November 14 quake and the Refugee Settlement organisation. Louise said it was important the boys understood the connection between what they were doing, and why. Keelan Macfadyen and Jaqkartah Toimafa-Holtham get to work painting a wall in Island Bay. A group of students learn more about marine biology, before heading out to clean Lyall Bay Beach. Students help out at St Aidan’s Church in Miramar. Nate Bussel and Jesse Carter help sort donated Marcus Thompson and Jonathan Tham jump in items at Shop 89 second hand shop in Miramar. the kitchen. Teacher aid Jared Nichols and Jordan Chan jump in the kitchen to make some Christmas cookies. Zach Campbell-Smith and Kit Jones help paint a wall in Island Bay. can become dehydrated very quicklyfor example the bottle of formula milk left out of the fridge. “Look out”, caution Self Care pharmacists, “for the danger signs of dehydration - dry mouth, tongue and lips, reduced skin elasticity, sunken eyes and cheeks, weakness, little urination. Children this young need to see a doctor if the symptoms continue for longer than 3 hours (for vomiting) and 24 hours (for diarrhoea).” The best treatment for ‘gastro’ symptoms is drinking plenty of fluids such as oral rehydration solutions. These contain the right amounts of electrolytes, glucose and water to replace lost nutrients. “A range of replacement fluids products are available from our pharmacies” advise Self Care pharmacists “and we can provide you with a copy of the Diarrhoea and Vomiting fact card that has helpful advice.” Begin fluid replacement as soon as diarrhoea starts and give small amounts of fluid often as large amounts at once may cause vomiting. Babies and children should be given a teaspoon of fluid every minute and adults should take a quarter of a cup every 15 minutes. Here are some simple food handling and cooking tips, and general hygiene measures to help prevent getting a ‘gastro’ bug or passing it on to others. Wash hands in hot soapy water and dry them well after going to the toilet, after changing babies’ nappies, and before touching food and preparing meals; have clean utensils and chopping boards; defrost meats thoroughly in the fridge and not out on the bench; keep raw foods in the fridge separated from cooked and ready-to-eat foods; refrigerate all foods until ready to use; use chilly bins with frozen pads inside to keep food cool, and keep them out of the sun; cook meats, especially chicken and other poultry, until the juices run clear and the flesh is no longer pink; cover hot food while cooling, and leave it to cool no longer than 30 minutes before putting in the refrigerator; reheat leftovers until they are steaming hot and only reheat once.  For more information on preventing and treating ‘gastro’-related diarrhoea and vomiting, and for a copy of the fact card, come and see your Self Care pharmacist. Also visit www.foodsmart. govt.nz for additional food safety and handling advice. Natasha Stevenson-Oake, Victor Chong, Penny Minshull, Linda Choie and Androulla Kotrotsos (owner), Sue McEwan (absent). To Lease WORK WANTED : Electrician - C M SECURE 14sqm per week. Electrical -STORAGE good prices for good$42 people. Call Matt 0220494870 or 5279187 Wainui Self Storage, Waiu St, 0274805150. CRAFTSMANComposed by Tony Watling 11th. Nov. 2015 PLUMBER Staff Wanted! Graham Plumbing & Drainage Ltd We are looking for highly skilled staff to Call John join us permanently on long term secured 970 2409 projects. or 027 457 4999 Our summer pools were built by us. 51. J.K. Rowling chose the unusual name ‘Hermione’ so young girls wouldn’t be teased For buyers in the Southern and Eastern suburbs for being nerdy! online. For confidential enquiries, please contact Hannah on 09 526 7519 or Louise on 04 576 1136. Successful applicants will be required to pass a pre-employment medical and drug screen. If you’ve got a talent then get ready to share it – whether it’s singing, playing in a band, dancing or something else – let us know. N Go on – don’t be shy. Sound and band equipment provided. The day kicks off with a Parade, followed by the official opening of your Island Bay Festival. The Variety Show is next, with performers entertaining crowds from the Band Rotunda. So get in touch with barriehutton@paradise.net. nz – tell us what you can do. We’re really keen to hear from you. View more about the Variety Show and the rest of Island Bay Festival at islandbayfestival.org.nz. there’s nine days of activities, including a Day in the Bay and Ribble Races. ADVERTISING TERMS & CONDITIONS All advertisements are subject to the approval of Wellington Suburban Newspapers. Advertisements are positioned entirely at the option of The Publisher & no guarantee of placement is given. Applicable loadings apply only to the specific placement of strip or island advertisements. Placement & approval is at the discretion of The Publisher. While every effort will be made to publish as instructed, The Publisher accepts no liability for any loss caused through loss or misplacement. The Publisher reserves the right to reject any advertisement considered unsuitable for publication. Advertisements will be charged on the size of the material supplied or the space ordered whichever is the greater. It is the responsibility of the Advertiser or Advertising Agent to notify Wellington Suburban Newspapers of any error within 24 hours of its publication. The Publisher is not responsible for recurring errors. To obtain a classified space order (defined as annual commitment of advertising space or spend) please speak to your advertising representative. (Surcharges may apply if commitment levels are not met or cancellation of a space booking & or contract). Cancellation: neither display nor classified cancellations will be accepted after the booking deadline. No credits will be issued to classified package buys that have commenced their series. If an advertiser at any time fails to supply copy within the deadline, it is understood & agreed that the last copy supplied will be repeated. Specific terms & conditions apply to certain classifications. These may relate to either requirements & conditions set by industry standards for the advertising of certain goods & services, or set by The Publisher. Please speak to your advertising representative to obtain a full copy of these. Advertisers agree that all advertisements published by Wellington Suburban Newspapers may also appear on a relevant website. Adults, children and chilled (relaxed/friendly) dogs welcome. Variety Show on Saturday 11 Feb 2017, Shorland Park. Applications are available at our recruitment office or at the security gate based in the Ngaurangathe George in Wellington. Servicing entire Wellington Region Contact Barry 472 7987 or 021 276 6654. By Russell Russell McQuarters McQuarters By By Russell McQuarters By Russell McQuarters 37.Bridge Bridgeclearance clearance(8) (8) 52.Provide Providefood food(5) (5) ACROSS 37. 52. ACROSS (abbr) (3)(3) 51. Angry (5)church, ACROSS (abbr) 51. Angry (5) ACROSS 38. Vividly expressive(8) (8) 53. Gothic ...Abbey Abbey(11) (11) 38. 1.Wild Wildstallion stallion(7) (7) Vividly expressive 53. Gothic church, ... 1. 33.41. Sphere (3)(3) 52. Solidify byleft cooling (7) 1.5.Result (5-6) 33. Sphere 52. Solidify by cooling (7) 1. Result (5-6) Cross-country runner (7) 54. Having a will (7) With little interest (4,7) 41.U.S. Cross-country runner (7) 54. Anaesthetic Having left a(5) will (7) 5. With little interest (4,7) 38. horse Derby (8)(8) 53. 7. (7)(5) 38. U.S. horse race;... ... Derby 53. Anaesthetic (5) 7.Courteous Scoundrel (7) 43. Short ariarace; (7) 11.Scoundrel 43. Short aria (7) 11. Courteous (5) 40. Restrained (8) 54. Humbleness (7) 11. Pulls (5) 40. Restrained (8) 54. Humbleness (7) 11. Pulls (5) 44.Research Researchscientist scientist(sl) (sl)(6) (6) DOWN 12.Idyllic Idyllicpoem poem(7) (7) 44. DOWN 12. Casual (7)sign 55. Friendship (11) 12. Deviousness (7) (7) 42. Casual (7) (6) 55. Friendship (11) Deviousness 45. Zodiac 1. Mohammeds’ birthplace(5) (5) 42. 13.12. Tent (5) 45. Zodiac sign (6) 1. Mohammeds’ birthplace 13. Tent (5) 44.46. Annual calendar (7) 13. Excellent 44. Annual calendar (7) Excellent Tropical parrot(5) (5) Various(7) (7) 14.13. Safe fly(5) (9)(5) 46. Tropical parrot 2.2. Various 14. Safe totofly 46. Scoffs (6)(6) DOWN 14. Alert (9) 46. Scoffs DOWN 14. Alert (9)(9) 47. Inferred (5) 3. In flower (6) 15. Restores confidence to (9) 47. Inferred (5) 3. Sound In Sound flower (6) 15. Restores 47. Manservant 1. (5)(5) 15. 15. So So (9) (9) confidence to (9) 47. Manservant 49. Weird (5) (6)(6) 4.1. Slumareas areas(8) (8) 16.Tree-trunk Tree-trunk (4) 49. Weird (5) 4. Slum 16. (4) 48. Form of expression (5)(5) 2. Sent (11) 16. 16. Directs (6) 48. Form of expression 2. Sent (11) Directs Peaceful(7) (7) 17.Fox Fox (7) (6) 5.5.Shy Peaceful 17. (7) 49.49. Water vapour (5)(5) 3. (8)(8) 18. 18. Skull (7) (7) Water vapour 3. Shy Skull Lightale ale(5) (5) 19.Harmony Harmony(6) (6) 6.6.Of Light 19. 50.50. Gambol (5)(5) 4. public revenue (6) 21. 21. Disorder (4) (4) Gambol Of public revenue Disorder Solution 7.4. Of the blood (6) (6) 23.Large Large monkey (6) SOLUTION 7. Of the blood (6) 23. monkey (6) SOLUTION 5. Turn outwards (5)(5) 23. 23. Racket (3) (3) 5. Turn outwards Racket last week — 19,December Craftsmen(8) (8) 26.Tomahawk Tomahawk(7) (7) For For September April 2003 1,2004 2004 SOLUTION SOLUTION 8.8.Constrict Craftsmen 26. 6. (7)(7) 25. 25. Take by by sipssips (3) (3) 6. Constrict Take For For September April 9, 2003 1, 9. Fertilizing land(by plane) 29. Decree (4) Solution last week, 11 November For For July April 28, 9, 2003 2004 For For July April 28, 9, 2003 2004 9. Fertilizing land(by plane) 29. Decree (4) 7. Has high morals 27. 27. Stake (4) (4) 7. Has high morals(8)(8) Stake (3,8) 30.Small Smalllump lump(3) (3) (3,8) 30. 8. Reduce (6)(6) 8. Reduce 28. 28. Artlessness (7) (7) Artlessness 10. Acts (5) 32. Mass of foliage (3) 10. Acts (5) (7)(7) 32. Mass ofchair; foliage (3) ... (6) 9. Sanction Chaise ... (6) 9. Sanction 30. 30. LowLow chair; Chaise 16. Brazilian palm tree(7) (7) 34.32. Display (4)hand 16. Brazilian palm 34. Display (4) 10. Audacity (5) tree Expert; ... hand 10. Audacity (5) 32. Expert; ... (3) (3) 18. Strip lace (5) 35.33. Candidate (7) 18. Strip ofofpleated lace 35. Candidate 16. Arrange in steps (7)(5) Strange (3) 16. Arrange inpleated steps (7) 33. Strange (3) (7) 20. Unaffected (7) 36. Play supervisor in two-up ‘Old Blue Eyes’ Frank ...(7) Zealous 20.17. Unaffected (7) Frank 36. Play supervisor 17. ‘Old Blue Eyes’ ...(7) 34. 34. Zealous (6) (6) in two-up 21. Put on(3) (3) (5)(5) (Aust) (6) 19. Competitor In brisk time(music) 21. Put on (Aust) (6) 19. Competitor 35. 35. In brisk time(music) (7) (7) 22. Gamble (3) 39.36. Long overcoat (6) 20. N.Z. Prime Minister U.S. state 22. Gamble (3) 39. Long overcoat (6) 20. N.Z. Prime Minister 36. U.S. state (4) (4) 24.1975-84 Stationers (11) 40.37. Road-surface substance (7) 24. 1975-84 Robert Biblical vessel (3) SirSir Robert ... ... (7)(7) 37. Biblical vessel (3) Stationers (11) 40. Road-surface substance (7) 25. Variety ofpigeon pigeon(3) (3) 42.39. Courage (4) 22. Boils (7) Curve (3) 22. Boils (7)of 39. Curve (3) (4) 25. Variety 42. Courage 27. Assumed name(5) (5) 46.41. Clumsy (9) 24. Catch Cupid (4) 24. Catch (3)(3)name 41. Cupid (4) 27. Assumed 46. Clumsy (9) 28. High hill (3) 48. Essential (9) 26. Group of whales 43. Exposed to air (7) 26. of whales (3)(3) 43. Exposed air (7) 28. Group High hill (3) 48. Essentialto(9) 31. Fore end ship(3) (3) 50.45. Formal statement beliefs(5) (5)29. 29. Topic (5)ofofship Female relatives (6) Topic (5) 45. Female relatives (6) 31. Fore end 50. Formal statement ofof beliefs 33. Racket (3) 51. Moulded from clay (7) 31. Uninvited guest (4-7) 48. An endless time(Lat) (9) 31. 48. Moulded An endless time(Lat) 33. Uninvited Racket (3)guest (4-7) 51. from clay (7)(9) Deoxyribonucleic acid handed people(inf) Deoxyribonucleic acid 49. 49. LeftLeft handed people(inf) (9) (9) 32.32. Double Glaze your existing single glazed timber & aluminium windows retaining the original look. DO DO ONE ONE ROOM ROOM OR OR THE THE WHOLE WHOLE HOUSE HOUSE Double Double Glaze Glaze your your existing existing single single glazeed glazeed timber timber & & aluminium aluminium windows windows retaining retaining the the original original look. look. “Do one Window, One Room or the whole house” We specialise in retro fitting double glazing to timber and aluminium windows. Because R&B Glass & Glazing use your existing joinery or framing, the look of your colonial bars, double hung, or wooden sashed windows can be retained. Therefore, you don’t have to compromise the character of your home just to keep warm – in most cases, the only difference you will see is the double glazing. We provide free consultations, measure ups and quotes and can advise on materials, designs and technical advice and pride ourselves on using quality products . Owner-operators Rene and Sandra Goedhart set up the business in 2006 and ensure that your experience with R&B Glass & Glazing will be personal, professional, and friendly. Shows original entrance / Plywood covers while joinery was out / Finished, awaiting owner to colour finish. Outdoor areas are often the last to receive design attention, but they shouldn’t be. What surrounds your home is just as important as what is in it. Whether it is the manicured front lawn or the rose garden just outside the home office, these spaces benefit from the same attention to detail as any bathroom or kitchen. Well designed landscapes complement the home's architecture and design, giving the home a story that can be read inside and out. Potted Up Incorporate a range of sized pots in your front yard landscape so you can easily change your plants as the seasons progress. Buy seasonal plants when the time comes and enblack black joy them without having to plant months in advance. This is a great way to show your personality through the design, colour and placement of the pots. Rocky Front The theme of using stone can be carried from the home to the landscaping. Use large boulders, shrubs, a stone pathway and perhaps even river stones as garden edging. The simple, earthy look is peaceful and low maintenance. Traditional Charm Simple yard decor, such as an antique iron gate and perfectly placed vegetation, gives the house a country estate quality. A circular driveway amidst the landscaping makes a great entrance for when entertaining. Aquatic Appeal A decorative water feature can make for a pleasing focal point for a front garden. Surrounded by flowers and foliage, water features provides a strong visual accent as well as a pleasing sound. DOES YOUR TV RECEPTION GIVE YOU A HEADACHE? Get your TV reception problems fixed by our experts. Free TV reception tests on your system to ensure you have the best possible picture available using our professional test equipment. al test equipment. s. Free TV reception tests on your system to ensure • FREEVIEW DIGITAL/SATELLITE TV you have the nal test equipment. tests ontelevision your system ensure you have andtoradio stations withtheno monthly charges. and guarantee that you will be satisfied with the results! sories sories he road. The French Door Factory Team’s aim is to always provide quality custom-made doors and windows at an affordable price, using the finest of materials. Think of us first when renovating an older style home or building your dream home. Wishing you a Merry Christmas and Happy New Year! • Carpet repairs • Broken Seams • Re-Stretching • Carpet Cleaning • Domestic • Commercial • Free Quotes We want to help you look after your carpet... get the best out of it... so we’ll do whatever we can to keep your carpet going and going. So we do re-stretching, patching, repair damaged seams & carpet fixing generally. Students from Miramar North School are looking forward to having their very own bike track. really excited about seeing this encourage participants to get out there and give Cigna Round the Bays a go next year,” he said. In the coming months K at ie wi l l joi n ot her #STEPITUPNZ contributors to provide motivational advice, training and nutrition tips.  To find out more and to ge t involve d with #STEPITUPNZ visit www. stepitupnz.co.nz or #STEPITUPNZ Facebook and Instagram pages. Phoenix coach steps down Ernie Merrick has stepped down from his position as Wellington Phoenix FC Head Coach. The announcement was made earlier this week and the club has since thanked Ernie for his contribution to Wellington Phoenix and wished him all the best in his future endeavours. strong squad that should be higher up the table. “It’s therefore the right time for me to step aside and allow someone else to take over. We have a run of home games coming up and I think this will give my successor the best opportunity to take the team forward,” Merrick said. “I’d like to thank everyone at Wellington Phoenix for the past three years and particularly Welnix, the Chairman and the board who have been nothing but supportive during this time.” Wellington Phoenix will now undergo a thorough process to appoint a new Head Coach. NZ’s Kane Train back on track New Zealand’s clean sweep victory over Pakistan should be lauded as a major achievement and a step in the right direction for Kane Williamson’s captaincy. The Black Caps have not won a series against Pakistan since 1985. Pakistan, believe it or not, are also currently ranked second in the world. The continuing success of the rather innocuous Neil Wagner with his short pitched bowling paid late dividends on Tuesday when Pakistan lost nine wickets for 71 runs post-tea to gift New Zealand victory. It shows New Zealand will be a challenge in home conditions against any team. There are frailties, especially with the middle order and a lack of genuine spin option but after a thumping against India, in India, this was a nice bounce back. Ross Taylor now has 16 test centuries, one less than his mentor, the late Martin Crowe. His 16th coming on Monday gave the home team control of the match and the series in a pivotal knock. He did it just a matter of days before eye surgery. New Zealand is now in Australia for the revived Chappell-Hadlee one day series. Three matches which have produced mammoth Kiwi moments will no doubt do so again. $ Join our “no card” loyalty club. Spend $100 and we’ll give you $ 10 back! Your friendly team at Strathmore Park Pharmacy is here to help you have fun in the sun this summer. Make us your one stop shop for all your summer requirements!